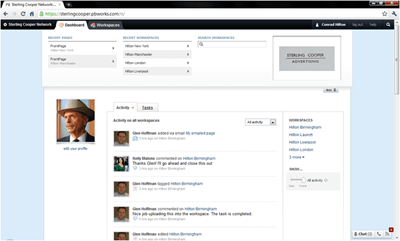 PBWorks is today launching another custom edition of its enterprise collaboration software. The Agency Edition is a customization of the standard PBworks product, this time specifically tailored for advertising, PR, marketing and design agencies. PBworks’ Chris Yeh told me that the product was created because of the specific nature of these sorts of organizations requirements – they’re often collaborating outside of the firewall, have some requirements around digital assets and also work in a highly dynamic, project based way – all challenges for collaboration software offerings. PBworks is playing the market smart and aiming to fill distinct verticals within the enterprise collaboration space. It’s a strategy that makes sense, this week being Enterprise 2.0 week we see just how many different products compete in this class of software – this fact is borne out by something Yeh mentioned to me, PBworks was up against 20 other collaboration vendors in a recent RFP – with that number of competitors, differentiation based on vertically specific offerings makes total sense. In terms of pricing, existing PBworks customers can upgrade for a one time flat fee, for new users, the Agency Edition is priced at $30/user/month. As would be expected, external access (from clients or partners) is free.